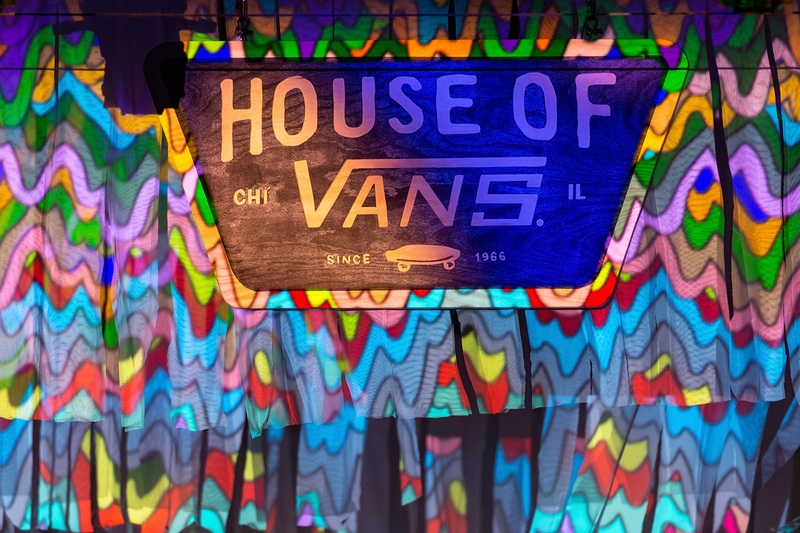 On a cold and dark Friday night, the good people in the development and outreach division of the Vans skateboarder apparel company opened the doors of their House of Vans building to provide a few hours of shelter, music, and booze to the winter-weary souls (and soles! Shoe pun because Vans makes shoes!) of Chicago. The artist Jen Stark, whose art combines the color palate of a Lisa Frank-branded grade school notebook with the visuals of an intense narcotic episode, provided the occasion, as her collaboration with Vans fruited some shoe designs – a just cause for celebration if ever there was one. And while a jaded music journalist might be tempted to label this event as a crude capitalist ploy by cynical corporate marketers to reach for relevance with their under-thirty primary demographic, those same marketers did provide several hours of free entertainment and beer. What kind of ingrate could criticize that? The visual art aspect of the event consisted of two high-intensity projections and some balloons, “for guests to interact with…” says the promotional flyer, adding that, “[Jen Stark’s] desert scenes… helped inspire the exclusive collection of prints that are available now on Vans Customs and Vans Family.” And while the projections were no doubt inspiring from a product development standpoint, interacting with them turned out to be difficult. How does one interact with a screen? Most “guests” took snaps with their phones, thereby owning a piece of the experience forever in digital format, which they could presumably interact with by running it through social media filters or something. Other people touched the screen and left finger smudges, a kind of contribution, or collaboration, sort of. But again, it was free, so whatever. Free, but also blissfully lacking in overt advertisements. Promotional flyer notwithstanding, at no point in the evening were the “guests” asked to buy something, or prodded to post their snaps online, or even required to sign on to a mailing list. The word “Vans” only appeared a few times inside the venue, mainly over the stage and on the walls (though in accordance with the company’s slogan, they should have been “off the wall”). The occasion for the event, Jen Stark’s trippy shoe designs, weren’t even on display, or on sale. The only cash register belonged to the food truck selling tacos in one of the side rooms. It was a nice event, and one that they could have charged for, and people would have gladly paid. In addition to the free drinks and a warm room with pretty pictures and balloons, alt hip-hop group Injury Reserve opened for the electronic music master Empress Of. Injury Reserve has a sort of emo/screamo/metal aesthetic that vibed well with the headbanger types in the audience, though the frontman missed a few lines, made some mistakes, ended a song early, and chided the crowd for not paying attention. But, hey, it was free. Empress Of played an excellent set, alternating beats with her multi-instrument music contraption – a device that required an assistant to operate, involving microphones and keyboards and cymbals, and looking way futuristic. Her voice has a dreamy quality, and she combines Spanish and English while playing off the music styles of both American continents. Call it a marketing strategy, or just a pleasant evening, but House of Vans and the venue’s big-business overlords put together a night of entertainment and asked nothing in return. If only all shows had that level of corporate benevolence!